Bulgaria has been in the European Union for 9 years but it might be the most obscure member to Americans. It's a little bigger in size than Ohio and its population of 7 million is about the same as the state of Washington. Unlike those states, it has a 24-hour folk dancing TV network, as well as separate TV networks for pop songs: one for men posturing in leather, another for women in constant motion like wacky waving inflatable arm-flailing tubemen. If you want to compare it to EU states, Hungary is the closest match in size and population. The only Bulgarians I had heard of before visiting were Christo the artist/opportunist and bad-tempered soccer star Hristo Stoichkov. I spent a week in Bulgaria recently, first as a judge at the Concours Mondial de Bruxelles, the world's largest wine competition, and then on a short and uninformative wine tour that took us to just two large industrial wineries in two long days (we also saw a monastery and a rose oil factory). So even by the standards of blogging, I don't know a hell of a lot about Bulgaria. But the odds are extremely good that, except for Ms. Nelly Nedeva reading this in Plovdiv, I know more than you. So here's what I know. 1. Bulgaria claims to have been the world's second-largest wine producer in the 1980s. Can you imagine? It's the size of Ohio and it made more wine than Spain, Italy or the US? In the Soviet era Bulgaria was tasked with providing wine, leading to some enormous wine factories where some of the equipment is still in use. Production dropped off a cliff after the end of Communism, but is rapidly rising, up more than 50% between 2011 and 2014, according to the Wine Institute. But still Bulgaria is now only 21st in the world, just behind Ukraine. 2. Like production, wine consumption is skyrocketing in Bulgaria, doubling in just three years from 2011 to 2014, according to the Wine Institute. At 20.6 liters per capita, it's still on the low end for a European wine producing country, a little less than Spain and New Zealand, but Bulgarians drink twice as much wine per capita as the US. 3. Much of Bulgaria is mountainous and a mountain range essentially divides the northern slice of the country, which borders Romania, from the southern part that borders Greece and Turkey. The northern parts are cooler and better white wine grapes come from there. Red wine grapes rule the rest of the land, but there is much intermingling. 4. You can get tolerable wine as cheaply from Bulgaria as anywhere in Europe. I was pleased by the acceptable quality of some of the wines that one enormous factory could crank out at under 2 Euros per bottle wholesale, which could put them in stores for under $8 US. That said, because I'm a wine snob, only a few of these wines would I drink myself. 5. Artisanal wine is hard to find. 6. Bulgaria doesn't seem to have a treasure trove of indigenous varieties like nearby Georgia, but there are a few. The most interesting is Mavrud, a red grape, which is too often blended or submerged in new Bulgarian oak, of which the locals have too much pride. 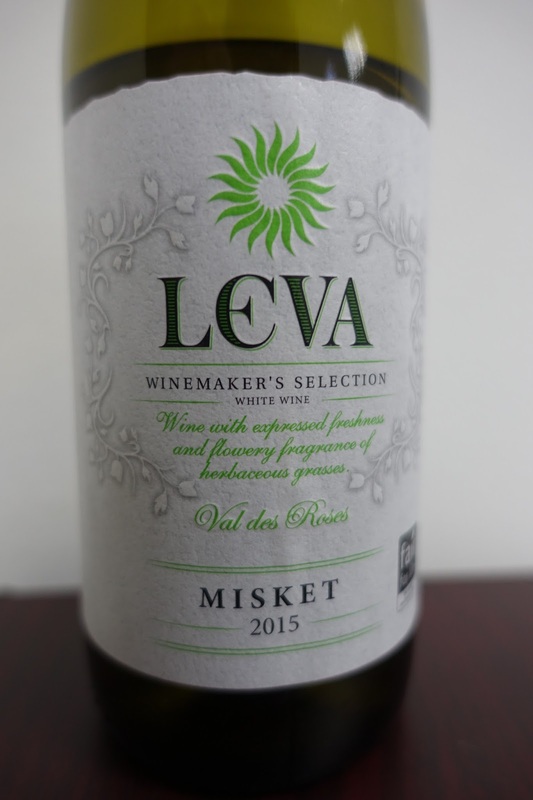 I also found some interesting white wines made from Misket, a white grape, but José Vouillamoz writes in Wine Grapes that there are three unrelated grapes called Misket in Bulgaria: one is a cross of Muscat while the other two aren't. So I don't know what exactly I drank. 7. French varieties have colonized the vineyards; Cabernet Sauvignon is the most planted grape. Many wineries blend indigenous grapes with French varieties, which yields generic results, though that may be the goal. 8. Most times when you read a wine story, the underlying statement is, and almost has to be, "Buy this wine, you'll like it." But I'm stymied here. If you're looking for an acceptable red blend and you see a Bulgarian wine in your local supermarket, go ahead, they deliver price performance. However, if you are a wine lover, only a couple of wines I tried out of the 80 or so I was force-fed would I recommend seeking out. 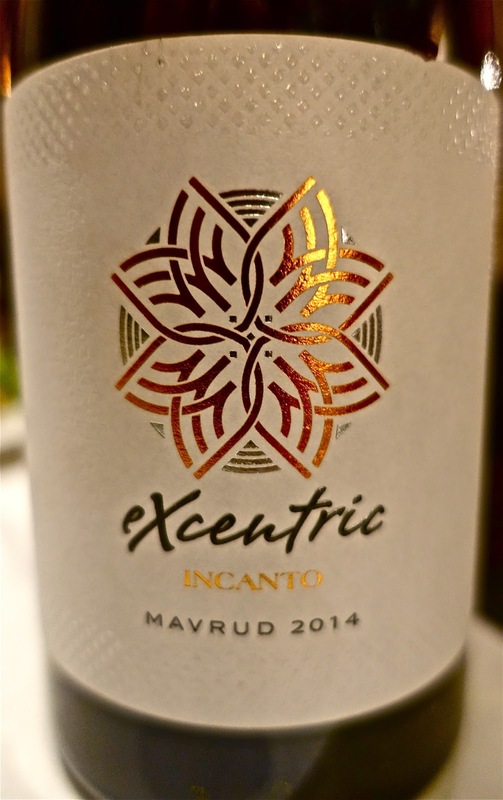 The best wine I had in the country, Excentric Incanto Mavrud from Medi Valley winery, doesn't seem available outside Bulgaria. That's a shame, as the winery looks very modern on its website and I mean that in the best way. The Excentric Mavrud is, for Bulgaria, very eccentric -- a single-vineyard wine made with graceful restraint. It was the only bottle that I eagerly finished, and it costs just $7.50. But is it worth flying to Sofia? 9. Did I say "force-fed?" Some Bulgarian wineries were so excited to have foreign guests that they wanted to make sure we tried all their wines during dinner. Like, every existing vintage. Others, alternately, didn't want us to taste their expensive wines ($30 US is pricey) for God knows what reason. One winery proudly displayed a Grand Gold Medal from the Concours Mondial for the previous year's Chardonnay, but didn't want to pour it for us, reasoning that it already had a Grand Gold Medal so why did we need to taste it? (This wine cost $8 US.) People were really sincere and nice, but hosting the international wine press will require a learning curve. 10. On food: the quirkiest thing about Bulgarian dining is that after introductory salads and the main courses (roast meats) have been eaten, people order a post-meal meat course. It's like the cheese course in France, but with various salumi as well as salty feta-like cheese. The salumi's not bad, but it's not Spain or Italy either. Bulgaria is not a good country for vegetarians. 11. Chefs don't use many spices. You do get some garlic, but otherwise ... when I got home I ordered Chinese food and shook a bunch of Old Bay on my salt baked squid, and sighed with pleasure. 12. Would I recommend a visit to Bulgaria? Well ... most people go for the skiing, but I don't ski. Some go for the Black Sea beaches. Food and wine is really cheap: a group of us had a fine meal of simple grilled meats, more than we could eat, with deftly roasted potatoes at a riverfront restaurant for less than 15 Euros per person. And Bulgaria is the world's largest producer of rose oil. I didn't bring any wine home, but thanks to the souvenirs I did buy, my world literally smells like roses.